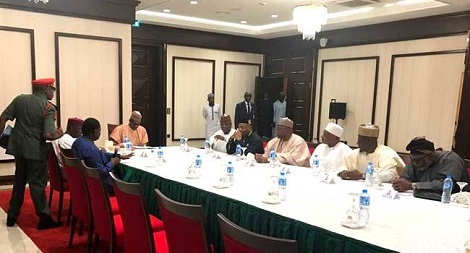 Buhari, 7 state governors meet at the presidential villa in Abuja – Royal Times of Nigeria. President Buhari is having a closed-door meeting with seven state governors at the presidential villa in Abuja. The state governors in attendance are Zamfara State Abdulaziz Yari, Ondo State, Rotimi Akeredolu, Kwara State Abdulfatah Ahmed, Akwa Ibom Udom Emmanuel, Bauchi State Mohammed Abdullahi Abubakar, Kebbi State Abubakar Atiku Bagudu, Ebonyi State Deputy Governor Eric Kelechi Igwe, Chief of Staff, Abba Kyari and the Special Adviser to the President on Media and Publicity, Femi Adesina. Reason for the meeting has not been disclosed.